The economic success of the Highlands is drawing organised criminal gangs to the area, a senior police officer said. Det Insp Gus MacPherson Northern Constabulary"
Supt John Darcy commented following the sentencing of a 30-year-old man from Liverpool caught trying to sell two stolen shotguns in Inverness. The Northern Constabulary officer said the region was being targeted by criminals from other parts of the UK. This week has also seen the force launch a team to help tackle the cultivation of cannabis. 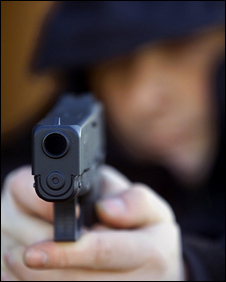 Previously, Northern Constabulary reported its officers were regularly dealing with incidents involving imitation firearms. 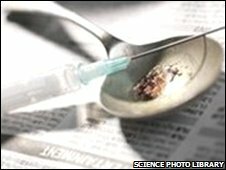 In May, it said drugs worth almost £1m were seized in the Highlands and Islands over the last year. Operations included one that ran for 18 months and led to the arrests of eight people. upt Darcy was responding to the jailing of Joseph Carragher for four years and nine months at the High Court in Edinburgh. Carragher was staying in Inverness when he was offered the guns, which had been stolen during a break-in by a stranger. He pleaded guilty to resetting two shotguns and failing to have a firearms certificate. Supt Darcy said: "This was a very difficult enquiry resolved by a dedicated team. "As I have stated on other occasions, the economic success of the area does bring with it the challenges of organised crime teams in the central belt and further south targeting this area." He said the Carragher case showed the force's resolve and ability to deal with organised crime. 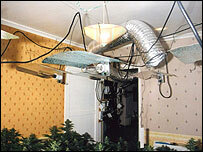 The shotguns had been stolen from a house in the North Kessock area near Inverness during a break-in in January 2006. Det Insp Gus MacPherson said: "The recovery of the guns was extremely important, following the break-in we dedicated a significant amount of resources to this enquiry, and it is always a concern when firearms are stolen as it is likely that they will end up in the hands of criminals. "Thankfully firearms being stolen is a rare occurrence." A jury in a court in Edinburgh Scotland in the last week (November 2008) has heard evidence from the family of Adam Hendry junior, that their son has been set up on false charges with falsified evidence, by the Bain family, who are a well known Scottish Gangster Drug Gang Family, who's son James Bain is already in jail for one murder and seriously wounding James Henry, the accused's cousin and threatening to kill the accused's father Adam Henry Senior. The background of this case was summarized by Adam Hendry's defense barrister and other witnesses, which shows a clear story of the Scottish Police-Prosecution and Court System being used by the Bain family who are a well connected and powerful Scottish Gangster Drug Gang family to set up young Adam Hendry on serious assault charges with false evidence, because the James Bain (Junior), who has children with the daughter of Adam Henry Senior and his wife Mary Hendry, is not being able to have anymore visits from his children while he is doing his time in jail for murder, threatening to murder and attempted murder. The whole basis and motivation of these false and wrongful charges against Adam Hendry seem clearly to be the result of the children of James Bain Junior, and the daughter or Adam (Senior) and Mary Hendry, no longer wanting to visit their father in prison. There is evidence that the children become too stressed and have severe negative behavioral changes in their behavior after they were visiting their father James Bain ( Junior) in prison. The accused, Adam Hendry ( Junior) has been a hard working Scottish boy, who had his own landscaping business and spent time in Australia where he felt he was making a better life for himself away from a negative childhood environment, who only came back from Australia to help his family. Adam Hendry ( Junior) was concerned for his sister and her children and has been a strong positive influence on these children who see Adam Hendry as a positive role model, in complete contrast to their father, James Bain (Junior), who has a long prison sentence to serve for one murder and seriously wounding James Henry, the accused's cousin and threatening to kill the accused's father Adam Henry (Senior). The trial ended today the 25th November, 2008 in the Edinburgh Courts and the jury have spent all afternoon deliberating, and obviously were having trouble reaching a verdict, and are continuing their deliberations tomorrow, Wednesday, 26th November, 2008. In an unusual and rarely used court power in Scotland, the court refused to allow any members of the public to sit in and hear the trial while the evidence was being heard. The whole case is full and an unusual mixture if strange behavior by the police, the prosecution, the court and the prosecution witnesses. It was during this time that the alleged assaults were meant to have occurred and the well supported alibi of Adam Hendry (Junior) shows that he was no were near the place of the alleged crimes at the time they were meant to have been carried out. There was evidence led by Adam Hendry and his wife Mary Hendry to confirm this, which was also supported by the game keeper who said he saw Adam Hendry Senior and Adam Hendry Junior in the field with the horse during the afternoon of the Wednesday the 16th of July, 2008. The evidence presented clearly supports the claim by the accused and their defense team that James Bain (Senior) cut himself and conspired with his wife Kim Bain, and their daughter Caroline Bain to make up the story that the accused Adam Hendry ( Junior) attacked and assaulted them on the 19th July, 2008 under instructions from James Bain Junior, from prison, as a pay back, because his children no longer wanted to visit James Bain ( junior) in prison and blamed the Adam Hendry and his family for this. There is evidence that James Bain ( Junior) has very powerful contacts in the criminal, police, prosecution and prison world, and even has his own mobile phone in prison, so he can continue to run his criminal net work and gang from prison. It appears that the Bain Family have some deeply rooted criminal and evil intent to destroy Adam Hendry ( Junior) and his sister, the mother of the children of James Bain (Junior), and the rest of the Hendy family, by setting up Adam Hendry and these wrongful and false charges, have him locked in prison, and then while he is in prison, use the powerful gangs the Bain family control in prison, to have Adam Hendry ( junior) murdered while in prison. The even more sad and disturbing thing is that the Bain Family are using the Scottish Police-Prosecution-Prison System and Court System to carry out their criminal aims. If Adam Hendry is wrongly convicted by the jury on the 26th September, 2008, then the Bain Family will have succeeded is their criminal endeavors in producing false evidence to the court to have Adam Hendry ( junior) wrongly and unjustly convicted, for crimes he clearly did not commit, as he simply was never there at the alleged scene of the so called crimes. There was never any weapon ever produced by the prosecution, the alleged offences were reported four days after the alleged offences where meant to be committed, and there was independent evidence that Adam Hendry was never near the scene of the alleged crimes on the dates and times that they were meant to have taken place. It is very surprising that these charges were ever taken to trial and that the accused Adam Hendry (Junior) was every arrested. Adam Hendry (Junior) has spent four months in prison without bail, waiting for a trial on offences he clearly could not have and did not commit. Adam Hendry (Junior) has lost a successful landscape business which has had to be closed because of his wrongful arrest. His life and his family's life has been all destroyed, even though it looks as though the jury are likely to find him not guilty on the 26th November, 2008. The whole case seriously damages the creditability of the Scottish Justice System, with those that have being involved in the case, would well know that it is wrong what has happened and should be corrected so justice is done. the system and find Adam Hendry not guilty of all charges. On 26th November the jury found Adam Hendry guilty of a the lesser charge of attaching the Bain family with his fists and his feet, but not with a knife, as the police, the prosecution and the prosecution witnesses had tried to convince the jury had happened. Anyone following this case would find it rather odd that the jury found in favor of the accused that he did not attack the Bain Family with a knife as alleged by the Bain Family under oath, thus showing that the jury believed the Bain Family were lying about that major and vital piece of evidence. So the question remains, why would the jury then believe the rest of the evidence of the Bain Family, who have been proven to be a family of unsavory character, who's son had gone into a hotel with a gun and murdered one person, seriously wounded another, James Hendy, a cousin of the accused, Adam Hendry (Junior) and is now serving along long sentence in prison. The answer seems to lie in the allegations that are emerging that the jury was set up the Scottish Crown, so that there were plants in the jury who's job was to make sure the accused, Adam Hendy ( Junior) was found guilty, regardless of the evidence produced at trial. The INL News Group has been provided information from one of the female jury members who stated that on the afternoon of 25 th November, 2008, that the jury voting was in effect only 5 guilty and the rest, not guilty or not proven. In Scottish Law a jury member can vote a not proven verdict which has the same effect as a not guilty verdict. For an accused to be found guilty the jury have to come up with 8 out of 15 jury members as a guilty vote. If there is 8 our more out of the 15 jury members that vote not guilty or not proven then the overall verdict has to be not guilty. Since the INL News Groups' first article appeared about the trial and Adam Hendry ( junior) on their www.inlnews.com web site, the www.NYTToday.com and hundreds of other web sites around the world, another jury member has anomalously contacted them saying they were a plant on the jury on behalf of the Scottish Prosecution to make sure Adam Hendry ( junior) was found guilty. It seems that even though the jury were meant to find Adam Hendry guilty of the more serious crime of using a knife as a weapon in the alleged assaults, honest members of the jury insisted as there was simply no evidence whatsoever that a weapon of any sort was allegedly used, so that there was no way even a dishonest jury member could push for a guilty verdict of assault using a knife. The other rather odd fact was that the only evidence even a dishonest jury could hang their hat on to find a guilty verdict, was a tiny speck of blood that appeared to possibly belong to the accused on a picture frame, allegedly found in the lounge room were the assault allegedly took place. There are a number of explanations as to how a tiny speck of blood of the accused could have been there on the picture frame without the alleged speck of blood being there as a result of the alleged assault on the 16th July, 2008. Also, in any event there was no blood found on the walls of the lounge room, it was only on the picture frame, which is a movable object, and well could have been placed in the room for the purpose of providing false evidence for the police and the prosecution, or on fact the police and/or the prosecution could have had a hand in masterminding this false evidence to become part of the evidence to be produced at the trial. The original charges laid by the Scottish Detectives against Adam Hendry (junior)included attempted murder. This serious charge was eventually dropped and brought to a lesser charge of assault using a knife, then even a corrupt jury could only find Adam Hendry guilty in the end of assault using his fists and his feet. The Scottish Government, the Scottish Detectives (CID), the Scottish Police and the Scottish Prosecution and the Scottish Court System would be facing a lot of public outcry and may be a serious damages claim to defend if Adam Hendy ( junior) was found not guilty of all charges, having been wrongly locked him up on false charges, that had no factual basis whatsoever since July, 2008 without bail which has destroyed his business and family life and his overall family with his father Adam Hendry ( Senior) becoming seriously ill as a result of all the stress and may have died, and may still die from all the stress on his son and family this all has caused. There are other serious allegations emerging that corrupt Scottish detectives ( CID are in fact involved with protecting criminal gangs running the multi billion drug industry in Scotland, which the Bain family are heavily involved with and James Bain ( Junior) is still running from his mobile phone in his prison cell with the help of corrupt police and corrupt prison guards. It has also come to light that a prison guard, was also a jury member and appears to be one of the jury members planted inside the jury room by the Scottish Police and Prosecution. Looking at all this, it makes sense why the Scottish Police, the Scottish Prosecution and the Scottish Court System have gone out of their way to help the Bain Family set up Adam Hendry on these false charges, and make sure he is found guilty, so that eventually Adam Hendry ( junior), who has been a wonderful role model for his sister's children, will eventually be murdered in prison by the criminal network run and controlled by James Bain and the other Bain Family members, from James Bain's prison cell. A police force has set up a team tasked with analysing evidence gathered from cannabis farms as it ramps up efforts to combat production of the drug. Northern Constabulary said its officers would also liaise with other forces. Cannabis cultivation has been detected in houses in Dornoch, Fearn, Nairn, Milton of Leys and Conon Bridge. Police have appealed to the public to be vigilant of suspicious activity and said houses in remote and urban areas had been involved. Det Ch Insp Peter MacPhee said criminals were renting detached properties, usually paying the lease in cash. He said: "Landlords or letting agents should check premises regularly. "I would also appeal to neighbours of leased premises or postmen or anyone delivering services to be vigilant. "There are a number of factors to look out for. Additionally, I cannot over emphasise the risks of fire to residential properties that have been turned into cannabis factories." The senior officer added: "The people involved in these crimes target properties which are isolated or are in new schemes or estates, where neighbours do not know each other and their activities can go unnoticed." Last week, a court heard how two men caught with cannabis plants worth almost £225,000 were betrayed by getting a huge consignment of compost. Hundreds of bags arrived at Dufftown, Moray, and police were alerted. Chaun Yap, 26, and Fang Zheng, 43, admitted being concerned in drug production. Sentence was deferred. Judge Lord Brailsford said: "Someone had 360 bags of compost delivered to a residential property? Bit of a giveaway, isn't it?" Illegal immigrants Yap, from Malaysia and Zheng, from China, admitted cultivating cannabis at Church Street, Dufftown, in March this year. After being alerted of local concerns about the compost, the High Court in Perth heard Grampian Police discovered a "large-scale cannabis cultivation" of 497 cannabis plants growing in a bedroom. Zheng told police he had been watering and feeding the plants and had been told by a gang member it was "expensive grass". Two men caught with cannabis plants worth almost £225,000 were betrayed by getting a huge consignment of compost, a court has heard. Hundreds of bags arrived at Dufftown, Moray, and police were alerted. Chaun Yap, 26, and Fang Zheng, 43, admitted being concerned in drug production. Sentence was deferred. Judge Lord Brailsford said: "Someone had 360 bags of compost delivered to a residential property? Bit of a giveaway, isn't it?" Illegal immigrants Yap, from Malaysia and Zheng, from China, admitted cultivating cannabis at Church Street, Dufftown, in March this year. After being alerted of local concerns about the compost, the High Court in Perth head Grampian Police discovered a "large-scale cannabis cultivation" of 497 cannabis plants growing in a bedroom. Zheng told police he had been watering and feeding the plants and had been told by a gang member it was "expensive grass". He said: "I was just like a fool." The court was told the basement had also been cleared and readied for a further batch of cannabis to be grown. Sentence on both men was deferred to the High Court in Edinburgh on 31 October and they were remanded in custody. Notices under the Immigration Act have also been served on the men. Four people have been arrested in connection with the cultivation of cannabis at a house in Dufftown in Moray. Grampian Police have confirmed that the four are Chinese nationals. Two men, aged 42 and 25, and two teenage girls aged 16, were arrested at the house in Church Street on Monday. They made no plea or declaration when they appeared at Elgin Sheriff Court. They were committed for further enquiry and were remanded in custody. Welcome to the Scottish Courts Web Site. This site provides a single access point for information relating to civil and criminal courts within Scotland, including the Court of Session, the High Court of Justiciary, the Sheriff Courts, Justice of the Peace Courts, District Courts and a number of other courts, commissions and tribunals. Details of recent significant judgments are posted on a daily basis; as are details of cases due to call in the Court of Session and the Sheriff Courts. The information provided on the site includes court rules, contact numbers, advice and location details. The site is managed by theScottish Court Service which is an Agency of the Scottish Government. 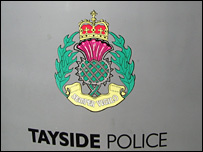 Police have discovered £300,000 worth of drugs at a cannabis factory in Inverclyde. Officers found more than 1,000 plants at a unit in Muirshield Road, Port Glasgow, at about 0035 BST on Wednesday. Strathclyde detectives said they were still trying to trace those responsible but were satisfied they had stopped the drugs from hitting the streets. The equipment seized, such as fans and lights, will be donated to charity. The organisation Glasgow the Caring City has so far received more than £200,000 of equipment which have been shipped out to countries in central Africa to provide horticultural aid. Equipment seized during police raids on illegal cannabis farms is to be sent to Africa, where it will be used to help grow vegetables instead. Strathclyde Police found compost, lights and fans worth more than £200,000 during the Operation League crackdown on cannabis growers. The equipment has been donated to a charity which will distribute it to farmers in Central Africa. Lights and fans will also be given to hospitals caring for Aids patients. The donations will be made by the Glasgow the Caring City charity. It will be the first time that the proceeds of crime have been used in such a way. Chief executive of the charity, Rev Neil Galbraith, said: "Having researched fully how best we can use this donation from Strathclyde Police, not one item will go to waste. "Many developing communities will benefit from this long term donation and the charity's insight and knowledge of development and partnership. "This is not recycling, this is regeneration and resurrection, from bad to good. I can think of no better use for the items being passed on." Rev Galbraith said the equipment would be a "godsend" to people in villages like Kaponda in Malawi. He added that the fans and lights would dramatically improve the quality of life for Aids patients. Detective Chief Superintendent Stephen Whitelock, director of intelligence at Strathclyde Police, said: "This is a new direction for the force and the first time that the proceeds of crime have been used in such a beneficial way. "It is heartening that the items seized from Operation League will be used for such a good cause. "Instead of criminals cultivating drugs for illegal purposes, the people of Africa will be able to use the equipment to cultivate vegetables and crops, essential for their survival." 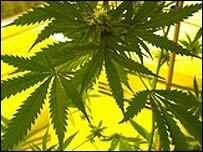 Cannabis plants with an estimated street value of £630,000 have been seized across Strathclyde. More than 2,000 plants were recovered from high value houses in Airdrie, Robroyston, Cambuslang, Clydebank, Battlefield and Budhill, in Glasgow. Strathclyde Police said seven cannabis cultivations were discovered as a direct response to appeals last month. Officers urged the public to continue to be on the look out for suspicious activity and the smell of cannabis. Det Ch Supt Stephen Whitelock, director of intelligence for Strathclyde Police, said: "Seven cultivations identified in a three week period indicates the level of concern by law abiding members of our communities." He said cannabis growth was not a victimless crime and there was a high risk of fire to nearby homes. "We have established factories in many areas throughout the force area, usually in high value houses in residential areas, sometimes newly built homes," he added. "The criminals who engage in this type of crime will rent properties in any area and it is our aim to disrupt and dismantle them." The finds came as part of the force's Operation League, which is aimed at targeting those involved in production. Det Ch Supt Stephen Whitelock urged the public to continue to report any suspicions about an address in their neighbourhood, either by calling the police or Crimestoppers on 0800 555 111. 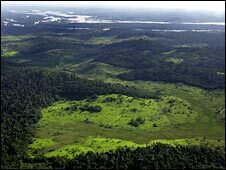 The destruction of the Amazon rainforest in Brazil has accelerated for the first time in four years, officials say. About 150 pilot whales die in a mass stranding in a remote coastal area of the Australian island of Tasmania. Cameroon creates a new national park for the Cross River gorilla, the world's rarest, ahead of a key conservation meeting. What have you done for your garden lately? The UK's Climate Change Bill may curb carbon emissions - but at what cost? Do you keep track of what you throw away? Is the UK's new climate law a global test case? A man has been arrested after the discovery of a cannabis factory at a house in Angus. Police who raided the three-bedroom property in Forfar found around 1,000 plants, capable of producing around £200,000 worth of the Class C drug. A 31 year-old is being held in connection with the find, Tayside Police confirmed. It followed a police operation in the west of Scotland that uncovered plants worth up to £3m at around 20 homes. More than a dozen people were arrested during Operation League, which kicked off in November. 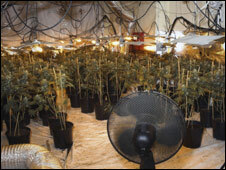 Det Insp Iain Wales, of Tayside Police, said that as well as being illegal, the cannabis farms posed a serious fire hazard. "These cultivations require lots of heat and this is achieved by effectively converting a normal house into a huge greenhouse, often bypassing the normal electrical supply and feeding directly from the mains," he said. As the shopping thoroughfares in Dundee and elsewhere become busier, Tayside Police is urging shoppers to take care of their personal security, their cash, belongings and purchases. Tayside Police have taken delivery of their latest recruit - an eight week old Spaniel named Fern - who will be trained to detect poisons and cash. More homes were broken into in the Dundee area over the past week, with the majority of those addresses having little or nothing by way of simple security that would have deterred thieves. The number of cannabis factories raided by police in Scotland has increased sharply, according to figures obtained by BBC Scotland. Strathclyde Police said the rise was partly due to a rise in the number of calls to the Crimestoppers phone line. The force raided 49 farms in the past six months, an increase from 12 in the previous year. A spokesman said cannabis farming was often run by immigrant gangs associated with people smuggling. The number of cannabis farms raided by police across the UK since April is already double the number in 2004/05. Grampian Police have discovered nine cannabis factories since April. The force had not previously found any such operations. Strathclyde Police launched Operation League, an intelligence-led campaign, late last year. Calls from the public increased dramatically earlier this year after its work was publicised. A Vietnamese gang which grew hundreds of thousands of pounds of cannabis in rented accommodation has been jailed for a total of 26 years. Police seized 1,500 plants from 10 houses in County Durham, Sunderland and Tyneside, where heating and lighting equipment had been installed. Twelve men and a woman, mainly illegal immigrants, admitted conspiracy to produce cannabis. 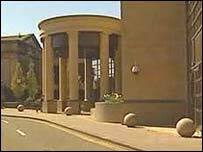 Their drugs yield was valued at about £220,000, Teesside Crown Court heard. The gang paid out thousands of pounds in advance to rent the houses in Lanchester, Bowburn, Sacriston, West Cornforth, Ushaw Moor, Bearpark, Sunderland and High Heaton. In sentencing, Judge Peter Bowers said they had taken part in a large-scale, highly-commercial and organised drugs business, producing the powerful "skunk" strain of cannabis. Watch the first phase of Operation Nimrod, closing open drug markets across the county. Police have charged a man with a second count of causing death by dangerous driving after a fatal crash in Bishop Auckland last month. A man who helped to set up a cannabis growing operation capable of producing more than £2m of the drug a year has been jailed for more than five years. The High Court in Glasgow heard that Jian He, 29, leased three houses in Cambuslang and one in Glasgow which were converted into cannabis "farms". They were staffed by Vietnamese men who operated the equipment and grew the cannabis. Lord Hodge recommended that He be deported at the end of his sentence. The court heard that the 29-year-old came to the UK to seek asylum 10 years ago claiming his family were being persecuted by the Chinese government. He admitted two charges of producing and supplying cannabis from the three rented houses in Cumbuslang and one in Glasgow. Two of the three Cambuslang factories were in Hawthorn Way and the other was in West Farm Grove. The Glasgow factory was in Ben Vorlich Drive. It cost between £10,000 and £15,000 to equip each house with the sophisticated cultivation equipment. He was involved in the operation between 1 November 2006 and 21 February 2007, during which time the cannabis crop could have yielded a potential £600,000. The judge, Lord Hodge, pointed out that the "farms" could have produced the same crop every 12 weeks. Jailing He for five years and three months, Lord Hodge said he had been involved in highly organised criminal activity to cultivate cannabis on a commercial scale. He was arrested after a police crackdown called Operation League. Earlier this month three Vietnamese men were jailed for two years for their part in the cannabis growing operation. Three Vietnamese men who worked in a cannabis factory which aimed to produce more than £1m worth of plants have each been jailed for two years. The High Court in Glasgow heard that Chinese gangsters had rented a house in Cambuslang to set up the factory. Tu Trinh, 26, Long Pham, 22, and Quang Nguyen, 21, also entered the UK illegally to work in their farm. Lord Uist recommended that the trio be deported back to Vietnam at the conclusion of their sentences. He added: "No doubt there were others for whom you were working who stood to gain much more than you did in this operation but you were the farm labourers who carried out essential work to enable this operation to get underway." The trio were convicted of being concerned in the supply of cannabis between 7 January and 12 January in a house at 106 Elder Crescent, Cambuslang. The court heard that the factory had produced between £70,000 and £200,000 of cannabis. It was being prepared to produce £1m worth of cannabis at the end of every eight-week growing cycle. During the trial the jury were told of a Chinese man called Jian He, also known as Xiao Fan Yang, 25. He was said to be one of the main targets of a police drive called Operation League to clamp down on cannabis farms run by Oriental crime gangs. Last month, also at the High Court in Glasgow, Yang admitted producing cannabis at four rented houses in Cambuslang and Glasgow. Two of the three Cambuslang factories were in Hawthorn Way and the fourth in West Farm Grove. The Glasgow factory was in Ben Vorlich Drive. The jury was told that Yang was involved in the acquisition of rented properties, locating potential sites, arranging leases and paying rents, usually in cash. At least one cannabis factory is being shut down by police in Scotland every week, one of the country's most senior officers has warned. Graeme Pearson, head of the Scottish Crime and Drug Enforcement Agency, said more than 60 industrial-level cannabis farms had been raided in the last year. Mr Pearson revealed there had been virtually no major cannabis production in Scotland until 12 months ago. He said the illegal factories were being set up by organised crime gangs. Mr Pearson said workers in the factories, which are often set up in residential areas, were frequently kept locked inside like slaves. The factories produced super-strength cannabis, which Mr Pearson said he believed was causing an increasing number of young people to suffer mental health problems. Recent estimates have suggested that about 60% of cannabis smoked in Britain is now home-produced, compared with only 11% a decade ago. The UK government downgraded cannabis from a Class B to a Class C drug in 2004, but has recently indicated it is considering reversing that decision. The original reclassification was criticised by many experts, who said it sent out the wrong message about the potential dangers of using the drug. Mr Pearson said: "It has gone from virtually no production just over a year ago to over 60 such productions being discovered by forces across Scotland in the last nine months. "What we have got is these types of developments within houses, factories, garages and so forth. "In a very high number of them we have got Chinese or Vietnamese people who are locked in the premises, kept sleeping on the floor amongst mattresses with no visible means of support. They are virtually slaves within the production mechanism." Many of the factories contain up to 1,000 cannabis plants and are capable of producing £100,000-worth of cannabis, making production in Scotland worth at least £7m a year. He said the trend of factories being set up to mass-produce cannabis was one that had spread around the world in recent years before finally arriving in the UK. He added: "Australia saw the trend, Canada saw the trend and now we now have it in the UK, where organised crime gangs are focusing on the industrial production of cannabis in order that they can up the potency of the product and therefore have a more marketable product. "Doctors have done experiments and gathered statistics which have shown that more people are coming to the attention of the health service because of difficulties with mental health. "I don't think it is a problem that law enforcement alone can deal with." Carla Ellis, project manager for the Crew 2000 drugs advice group, said more research needed to be done on the potential links between mental health and cannabis use. She added: "I think we have to remind ourselves that the vast majority of people who smoke cannabis will not have any problems associated with their use. "They will probably use it for a very short period of time and they will probably stop as the consequences of their use clash with their lifestyle. "Many people do see it as relatively harmless compared to other drugs." London's housing market is slowing the growth of new cannabis factories in the city, according to a new report. The city's escalating house prices are hitting the profit margins of gangs who operate such premises, the report from the Metropolitan Police Authority says. Between 700 or 800 properties in London are equipped with hydroponic systems and lighting to cultivate large amounts of the Class C drug, it claims. They are often run by Vietnamese gangs who rent or buy houses, police suspect. The practice has become increasingly common across the country in recent years, and more than half the cannabis consumed in Britain is now believed to be grown in London. Hi-tech police tactics such as using thermal imaging cameras to detect cultivation equipment have helped to cut the growth of factories, the report says. However, the report also indicates that booming house prices also share some of the credit. "Intelligence indicates that the number of new factories being established in London is gradually reducing (although there is a suspicion that house prices play a part in this)," the report says. "The Metropolitan Police has employed a number of tactics including the use of thermal imaging, training on how to identify potential factories, and engaging with landlords and electricity companies to build intelligence pictures." A semi-detached house in south London which was being used to produce cannabis has been closed down, police have said. Officers raided the house in Broad Walk, Kidbrooke, in Greenwich and found 400 to 600 plants at the address. Police believe the street value of the cannabis would be about £100,000. A man aged 21 was arrested and is being questioned in connection with the cultivation of cannabis and abstracting electricity. 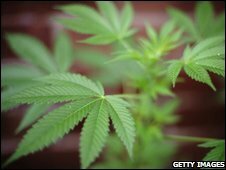 The number of cannabis farms being found by police has trebled over the last two years, according to a report. Charity DrugScope said 1,500 cannabis farms were found in London alone in the past two years, compared with around 500 in the previous two years. 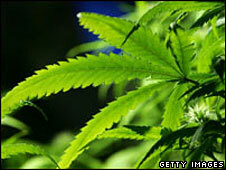 Its magazine Druglink said over 60% of cannabis sold in the UK was grown here, compared with 11% 10 years ago. The charity said analysis of police raids showed up to 75% of cannabis farms were run by Vietnamese gangs. In the last 12 months, Vietnamese-run cannabis farms have been found in London, Birmingham, south Wales, the North East, Yorkshire and East Anglia, DrugScope added. An average of 400 plants are recovered in a police raid, as officers continue to target farms in residential and commercial properties. In London, where the class C drug is worth £100m a year, the Metropolitan Police says it has closed down two to three factories a day and destroyed 1.5 tonnes of cannabis a week over the past 18 months. Charity spokesman Martin Barnes said many of the farms were set up in empty residential properties taken over by the growers. "Sometimes, often because of the link with people trafficking, somebody can be committed to actually looking after the property," he told BBC News. "We have come across cases where neighbours have actually reported the existence of these plants because burglars have broken into a house, have accidentally stumbled upon cannabis and have been seen running away with the stuff." Do drug laws need an overhaul?